Junk food advertising could be banned across the entire Transport for London (TfL) network, City Hall has announced. The junk food advertising ban forms part of Mr Khan's London Food Strategy, which has been published for consultation. TfL's director of TfL's transport strategy Lilli Matson said it had a "large advertising estate with a diverse audience", and is supporting the mayor's attempts to make London healthier. Image caption Sadiq Khan has described London's child obesity issue as a "ticking time bomb"
Mr Khan wants to "reduce the influence and pressure that can be put on children and families to make unhealthy choices". He said: "I am determined to do all I can to tackle this issue with the powers I have and help Londoners make healthy food choices for themselves and their families. "That is why I am proposing to ban adverts for harmful junk food from our entire Tube and bus network." Mr Khan intends to ban adverts for food and drinks high in fat, salt or sugar. A spokesman for the mayor's office said if the ban comes in "everyone will be affected, whether it's the biggest fast food chain or the most niche", and their products will be assessed against the nutrient profiling model developed by the Food Standards Agency. Companies could, he added, choose to swap their adverts for burgers or fizzy drinks for "healthier products within their range, such as salads or bottled water". The burgers may be banned, the fizzy drinks may fizzle out, but have we seen the last of adverts from companies who make their money selling such things to Londoners? The truth is, probably not. It seems the mayor is trying to have his (low-calorie) cake and eat it. Perhaps aware that high sugar, fat and salt ads bring in around £13m for TfL he says his new ban will not apply to companies - just to their less healthy products. Advertise with us, he'll say, as long as you're pushing your healthier wares. That could cut the expected losses to TfL, but how does the policy fit into a wider business plan that sees shops at stations selling unhealthy snacks? Or kiosks on the Tube selling chocolates and crisps? "We can all indulge occasionally," the mayor told me. Advertisers will now have to decide how occasionally they wish to indulge when it comes to the big sell on London's Tube and buses. Chef and health campaigner Jamie Oliver - who has said London "now has the most overweight and obese children of any major global city" - described the proposal as "bold". Image caption The Advertising Association says a ban would have "little impact"
It has identified "stark differences" between boroughs, with children from poorer areas "disproportionately affected". 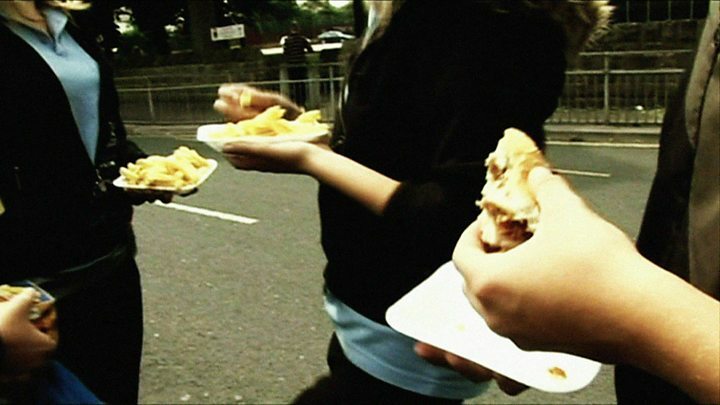 Young people in Barking and Dagenham are almost twice as likely to be overweight as children from Richmond-upon-Thames, it says. "We need to ensure those families have access to nutritional and healthy food but aren't disproportionately exposed to adverts for unhealthy foods," Mr Khan told BBC Radio London's Vanessa Feltz, adding that there are some parts of London "where you simply haven't got access to fresh fruit and veg". Reality Check: Is UK among worst in Western Europe for child obesity? Russell Viner, president of the Royal College of Paediatrics and Child Health, said advertising was "one of the leading contributors for the growth of child obesity", adding: "It is therefore vital, especially in cities like London where deprivation is high, that it is tackled." An Advertising Association spokesperson said the UK already bans advertising of high fat, sugar and salt (HFSS) food or drink products in all media where under 16s make up more than 25% of the audience. He added that for outdoor advertising, such as posters on the Underground, there is a recommendation that no sites can carry HFSS advertising within 100m of any school. "International experience and independent research has shown an advertising ban would have little impact on the wider societal issues that drive obesity," he said. Today's announcement has been welcomed by healthy food charity Sustain and the Obesity Health Alliance Lead, which said it hoped the Government would follow suit by banning junk food ads on TV after 21:00 as part of chapter 2 of its obesity plan. The Department of Health said it has "not ruled out taking further action" following its tax on sugary drinks which came into force last month.